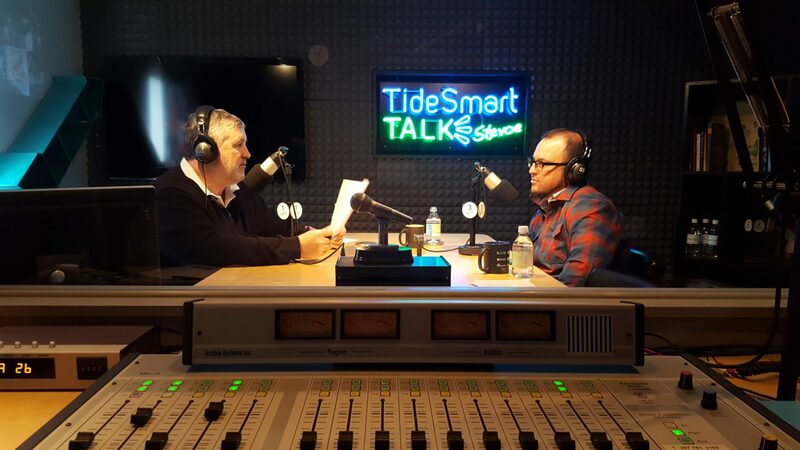 We recently welcomed back Adam Burk to the TideSmart Talk studio. In advance of this year’s TEDxDirigo, Burk spoke about how he and the other producers build the event and had a quick talk with Stevoe about new programs at the Treehouse Institute and his involvement with Portland Global Shapers. Host of TideSmart Talk with Stevoe, Steve Woods, welcomed Producer of TEDxDirigo, Adam Burk (at right). Maine’s first TEDx event was in 2010 after TED started testing the waters of the “TEDx” local events. They weren’t convinced it would be a success, but much to their surprise TEDx has exploded across the country. This is TEDxDirigo’s 9th annual event and Burk expects to sell over 300 tickets. Following the TED theme, TEDxDirigo talks must be less than 18 minutes and presented with no notes. The speakers for this year’s event were, as always, chosen based on nominations made by the public. The production team narrows the 150 nominees to a panel of 15 speakers. This year, Burk and his team didn’t choose a topic for their talks, but rather a theme: Dissonance. As the event was held just before the elections, Mainers were likely to be more passionate about certain topics. Burk said that the speakers were likely to touch on certain “political topics,” but none of the talks were going to be politically focused. In Burk’s life at the Treehouse Institute, he was recently asked to build a Portland hub of the Global Shapers Community, an initiative of the World Economic Forum, which has over 450 other hubs in cities across the world. The Portland Global Shapers ” aims to cultivate an inclusive, sustainable, and resilient city whose residents are invested in the welfare of Portland.” They are working on four initial projects is called “Portland Participates, Resilient Portland, Girls Driving for Change and Hi, Neighbor.” All of these projects focus on getting Portlanders invested in their communities in different ways. For more information on TEDxDirigo, the Treehouse Institute or Portland Global Shapers, please visit theTreehouseInstitute.com. Posted on Monday, October 17th, 2016 and filed under Show Recaps.